Kenosha Pass and the ridges thereafter offered expansive views across the Cretaceous seaway that is now called South Park. Across those once sea swept plains, rears the Divide. A toothy grin cast skyward and yawning into distances untold. Something about her makes the blood in me tingle and lurch. So I hurried forward, tackling every climb and trotting downhills until I came to Georgia Pass, panting up through the gnarled Bristle Cone Pine. Despite their stunted stature these rugged stalwarts can be up to 5000 years old and will climb across a pass, inch by inch, year by year in the gusting winds and weather of the alpine world. Fascinating. Thunderclouds rolled lazily over Georgia Pass as I ducked in the last of the trees before the crest of the pass itself. When one particular cell, who seemed more of a push-over than his buddies, took eminence, I made a dash for it. Finally catching the CDT I was pulled up short just over the rise by a Trail Magic encounter. The difficult decision of Lemon Lime or Cream Soda from the blessed tote. (Lemon Lime seemed the better choice for storm watching). A long and pounding decent back into the realm of mosquitoes and, my home turf. 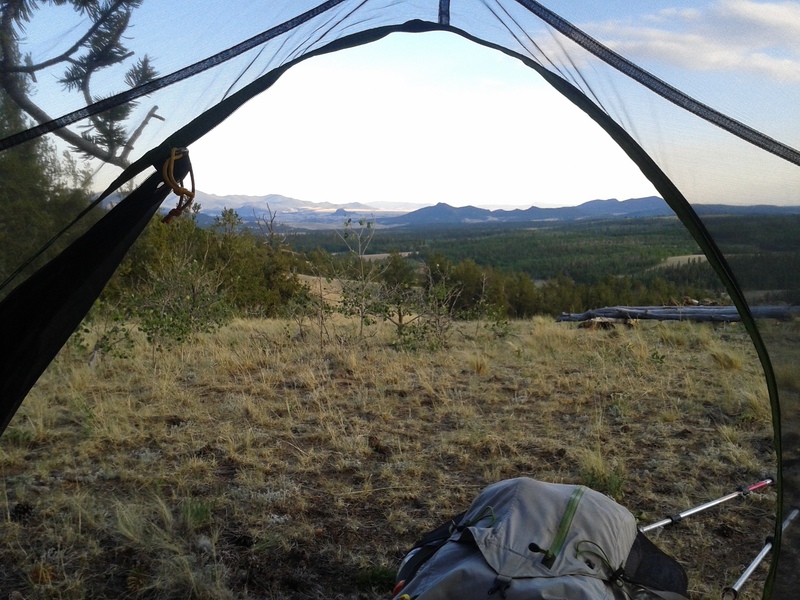 Camping along the Middle Fork of the Swan River, one of the three tributaries to Dillon Reservoir, I went about the evening routine of tucking in and pouring over maps; where have I been, and where am I going (Gee, sure would be nice if the maps had CONTOUR LINES!!!>(. The ravines and ridges the next morning revealed the back bowls of Keystone Ski Resort, which inspired a wild hair which has tickled my mind since my father told me that Teddy Roosevelt did ‘point to point’ hiking as a boy. From atop the divide I used my compass to shoot a bearing of the neighborhood where Christina and Doug live, and moved in that direction. A side trail gave way to a faint use trail, which became an animal track, which dissipated on a particularly steep face. Downward I went, clinging to trees to avoid slipping and happened upon a wild little spring. For a moment I sat silently in the trees, sipping mountain fresh water and watching clouds roll past, shadows contouring and jumping across the landscape below and around me. Further down still I happened into a logging operation, where a Forest Service agent sent me down to a fancy pants golf course where the Rent-a-Cop seemed more perplexed than bothered by my sudden and mangy appearance. Twigs sticking out from frayed braids under a sun worn hat and smelling like a week’s worth of stink, he just seemed happy that I didn’t want a ride in his golf cart. And now I am home, resupplying and checking in on life and work before hitting the trail again on Saturday morning. Thank you for your ongoing encouragement and support. 105 miles down, 381 to go. Colorado Trail: Why Squirrels gotta Hate? you live an interesting life, to be sure. when’s the book come out?